When you hear the title “lifestyle consultant” or “life coach”, what comes to mind? Lifestyle consulting has become somewhat of a trendy career path in 2019. And if trends make you skeptical, you’re thinking critically. Not all lifestyle consultants are qualified to advise you on all areas of life. So, don’t feel bad about rejecting help from your high school classmate who just got her certification. If it feels inauthentic, there’s probably a reason. But I hope the popularity surge doesn’t scare you away from lifestyle consulting completely. Because it’s truly a transformative and life-changing experience… when you find the right consultant. Now, on to finding that perfect consultant for you (spoiler alert: you’re already in the perfect place). I’ve been an intuitive consultant and also known as, “the corporate psychic” for over twenty years. And my life’s work has brought me to a place where I can connect individuals like you with lifestyle consultants that I’ve personally vetted. I’ve written this guide to help direct you towards the best decision for your life and goals. What is a lifestyle consultant, really? What’s a vetted lifestyle consultant? A professional lifestyle consultant’s main goal is to help clients improve their lives – in virtually all areas of life. These people must be perfect to be experts in all these important areas of life. And as much as I’d like to be able to say that’s true, it’s not. None of us are perfect. But what makes lifestyle consultants different is that they’ve focused on educating themselves in these areas. And, what makes professional consultants very effective is their area of expertise. And they’ve made a commitment to follow their own advice. A lifestyle consultant will likely have a specialty, but a good one may be able to advise you on other areas of life. Lifestyle consultants can also provide professional advice based on varying principles. For example, I know many wellness consultants who specialize in nutrition and fitness. These are the people I recommend for someone who is looking to improve their health and overall well-being. But many of these wellness consultants are also able to intelligently advise on personal transformation and relationships. And if someone is focused on meeting their career goals, I’d connect them with a lifestyle coach who specializes in career or business guidance and style. But that consultant may also be able to guide someone towards making healthy nutritional choices to address the entire; body, mind and spirit. Lifestyle consultants can also deliver professional advice based on varying principles. So when you’re looking for a lifestyle consultant, try to find one whose beliefs align with your own. The following are examples highlight a few areas of expertise that a lifestyle consultant or life coach may specialize in. You don’t have to be rich and famous, like Oprah, Bill Gates, Steven Spielberg, or financial institutions like Bank of America Corporate Executives to reap the benefits of the 3000 year old Chinese philosophy called feng shui. Feng shui is not religion or superstition; it is a science because its formulas and fundamentals are based on empirical research and it is an art because experience and judgment are critical in the analysis. Feng Shui focuses on the study of Qi (pronounced “chi”, which is energy) and how it can be harnessed to create harmonious living; better health, successful career or business, and fulfilling relationships for the people inhabiting the space. Today, many feng shui consultants can work virtually. For example, a feng shui consult with Amanda Gibby Peters is designed to get you motivated and untangle what’s not working well, to anchor life support around you. You can email a photo or sketch of your floor plan or a specific room, and she will provide a plan of action to get your life on track personally or professionally. Are you feeling blah? Or perhaps you are dealing with health issues. Sybilla Lenz Feng Shui Consulting focuses on a “healthy home-healthy you” environment. She’ll be the first to tell you that having a cluttered home is like having a clogged artery. Check out her audiobook; Healthy Home – Healthy You. Looking for a unique approach to marketing your business? Consider a feng shui expert with marketing knowledge. Certified feng shui consultant, Karen Lynn Ferraro uses feng shui for marketing. For example, Karen worked with a client to redesign their business card and marketing brochure. Feng shui is the art of placement. It’s utilizing water, fire, wood and metal elements. Karen redesigned her client’s business card starting with moving the placement of their logo, incorporated feng shui elements for a brand new look and vibe. Within a week after the newly designed pieces, the client received a coveted invitation to speak at a conference which included a handsome speaker’s fee. That’s the beauty of feng shui. Results can happen immediately. Explore feng shui and learn how to prepare and maximize your feng shui consultation. Dreams serve purpose for inspiration, inventions, creativity and provide answers to our questions. David Low, MS Ph.D. is a dreamwork consultant who can help you interpret the symbols and visuals of your dreams; to help you understand your spiritual self, as well as your personal and professional self. Understanding the meaning of your dreams can also help you grow spiritually. Learn more about the benefits of a dreamwork consultation. What is an intuitive consultant? An intuitive person is someone with ESP, yep, psychic abilities. Parapsychologists define extra-sensory perception (ESP) as the umbrella term for; intuition, clairvoyance, precognition, mental telepathy. Depending on the sensitivity of the individual or the intuitive consultant, he/she will use two or three skills simultaneously. An intuitive consultant can provide fresh solutions to old problems, answers to burning questions or simply confirm your own intuition about an issue. A few can also assess situations and even make accurate predictions about the short term or long term a business, relationship potential. Trust me, there is a big difference between an actual psychic, intuitive consultant or spiritual medium and the charlatans out there who take advantage of naive and often desperate folks looking for spiritual guidance. Rather than risk time and money consulting with unsubstantiated intuitive consultants, psychics or spiritual mediums, AYRIAL helps you with your due diligence in featuring qualified professional intuitive consultants, psychics and spiritual mediums. BaZi Astrology and Western Astrology are similar as a client’s chart is based on the date and time of birth. Yet Bazi Astrology is a form of feng shui astrology. In the Bazi, or Four Pillars feng shui school, knowing yourself and your energy means you can make the best of what is given to you by destiny; or the factors present at the time of your birth. Feng Shui assessments and BaZi astrology readings provide information that shows the potential for future situations, which allows people to make informed decisions at the present time. It is not a matter of predicting the future, it is a matter of getting information today, to create the future that we want tomorrow. It is a matter of becoming aware of the opportunities and threats that are coming our way to be able to plan our actions ahead of time and live a happier and more fulfilled life. A BaZi and feng shui consultation would be an incredibly in depth! Have you ever hired a personal trainer to help you with your fitness goals? Those are all reasons why you might hire a lifestyle consultant. Much like a personal trainer understands physiology, a lifestyle consultant has specialized knowledge in business, finance and personal relationships. Let’s dig deeper to explore the many benefits of hiring a lifestyle consultant. Have you ever suffered from analysis paralysis? You probably knew the right answer all along, but information overload has you second guessing. A lifestyle coach can help this situation in a few ways. They can act as a sounding board as you talk through the pros and cons of your decision. And they can also help you consider things you may have missed in order to come to the best decision. Your lifestyle counseling session is all about working through your road blocks to help you achieve your goals. We’ve all made poor decisions that cost us money. And sometimes, it’s big bucks. These things could include choosing the wrong job offer or investing in a business that doesn’t turn a profit. It could also include spending money on education that’s not going to be helpful to your career. If you were working with a lifestyle consultant, you ideally would have made more profitable decisions. Well, as a rule, personal and business consultants help clients avoid hasty decisions. When you work one-on-one with a professional lifestyle consultant, they’ll ask you to slow down and help you consider all factors and potential outcomes. We all have negative patterns of behavior. And oftentimes, these are the patterns that hold us back from living our best lives. Maybe you show up late to work every day because –deep down—you don’t believe you deserve that promotion. Or maybe you cheat on your diet because you’re afraid of how your life will change after weight loss. These are examples of ways we subconsciously hold ourselves back from things we truly want. But when you work with a lifestyle consultant, he or she will hold you accountable. Suddenly, you have someone to answer to. You’ll have someone to call you out on your negative patterns. And suddenly, you can’t ignore that you are the only one standing in the way of your success. Are you dressing for the type of success you want in your life? Do you need to mange your time better in order to make room for better things? When you work with a lifestyle consultant, all areas of your life will seem to meld together as you work towards a common goal. In order to achieve true success, all areas of your life must be aligned. You can be successful in business and up to your eyeballs in debt. You can have healthy relationships and an unhealthy body. You can have success in one or more areas and still be misaligned. A lifestyle consultant will help you bring strength to your weaknesses and re-align areas of your life by providing valuable intuitive insight, spiritual guidance, feng shui knowledge, and other areas of expertise. The result? A deeper level of happiness – unlike anything you’ve felt in a long time. Present you with a few specific goals and action steps to get you there. Achieving your goals is an important part of a lifestyle coach’s job. But it’s not all of it. That might need some explaining. You see, it’s possible (even likely) that you can achieve your goals without achieving happiness. In this instance, a consultant will help you work through roadblocks in the way of your happiness. A professional lifestyle consultant wants you to succeed. They also want you to be happy. 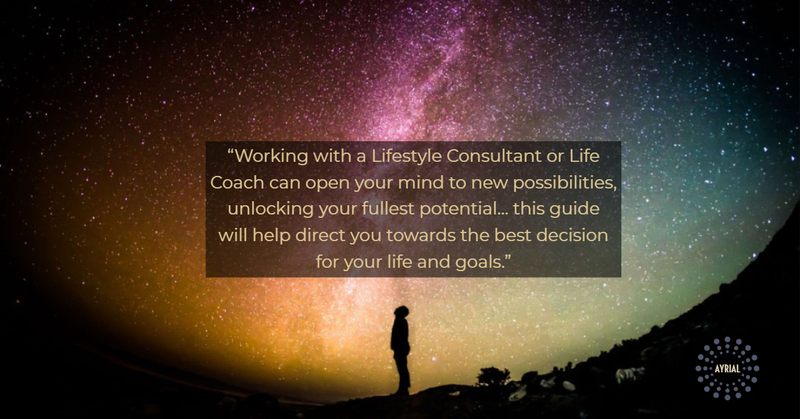 What’s the Difference between a life coach and lifestyle consultant? The terms life coach and lifestyle consultant are often used interchangeably. In most cases, they’re working towards the same goals. Professional life coaches and lifestyle consultants are in the business of helping clients achieve their personal, professional goals, help with relationships and wellness. Your life coach is dedicated to maximizing your potential as an individual, so they may design a program will be tailored to your specific needs and goals. Life coaches are trained to help their clients come to the right conclusion for them. The foundation of coaching is that the answers always lie within, and it’s up to the coach to help their clients find the answers. Lifestyle Consultants offer a more direct approach by assessing the situation and providing targeted advice based on their area of expertise: intuitive consulting, feng shui, dreamwork, health and wellness, etc. The differences are very subtle. And one isn’t inherently better than the other. It’s more about the individual client’s needs. Ultimately, it’s all about making choices that are best for you. So in both cases, you should expect personalized results. By now, you should realize that lifestyle coaching and consultancy is important business. After all, these are people’s lives we’re talking about. No one goes to a lifestyle consultant to figure out whether to switch to non-dairy creamer. If you’re seeking the help of a professional, you are ready to make important choices that could impact the rest of your life. And you don’t want to trust just anyone to this decision. That would be dangerous. You want someone who is actually qualified. That’s why it’s so important to work with a vetted lifestyle consultant. A vetted lifestyle consultant is someone whose skills and experience have been vetted by a 3rd party. Work experience – Has this person successfully coached and consulted with others? Do they have references? Experience is everything in this industry. It’s okay to take a chance on someone who is new to the field, but you should be fully aware that this is what you’re doing. Also, the consultant’s rate should reflect their experience. Life experience – Age isn’t always an indicator of life experience, so be careful about falling into this trap. But if you’re looking for career advice, you probably don’t want to consult with someone who just graduated college. That person might be a great lifestyle coach for high school students, just not you. Education – You may be tempted to think that life experience is enough to qualify someone to be a life coach or lifestyle counselor. But I’d advise against going on life experience alone. Education helps prepare consultants to get to the root of their clients’ issues. Through education, consultants learn tips and techniques to get the most out of every session. But you should also know that consultancy and coaching programs vary greatly. They can range from 5 days in length to 6 months. And regardless of length, some programs are better than others. I’ve worked with many coaches and consultants in my career. And I can spot the good ones from miles away. And after you review experience, accolades and education, it all comes down to your intuition. When you’re interviewing a potential life coach or lifestyle consultant, you’re ultimately going to choose someone who you vibe with. You’ll leave your first meeting with a great feeling of hope and positivity. I don’t put much faith in coincidences. You’ve landed on this page because you’re at a crucial point in your life. You’re looking for some guidance in the form of a life coach or lifestyle consultant. But the process of finding the right person is overwhelming. Actually, I came to this exact realization myself. That’s why I founded AYRIAL. AYRIAL is an association, but it’s also a like mini search engine for qualified, fully vetted life coaches and lifestyle consultants (and more, but I’ll get to that in a moment). Why search AYRIAL instead of Google? Great question. When you search Google, you’re likely to find the life coaches and lifestyle consultants that are closest to your geographic area. And while this is all well and good, that’s really all you know about them. You don’t know that they’ve received a high-quality education, have real life experience or have worked with other clients like you. When you search Google for a lifestyle consultant, you still have a lot of work to do. Because you have to vet that lifestyle consultant yourself. When you search the AYRIAL Association of vetted lifestyle consultants and life coaches, you can rest easy knowing that you’re getting high-quality results every time. At a glance, you’ll see a consultant’s area of expertise, client services, testimonials and location. Most are available by phone, Skype, Zoom, too. You’ll find more than just life coaches on AYRIAL. You may be able to find a life coach that meets more than just your coaching needs. Many coaches and consultants specialize in other areas too. Here, you’ll find intuitive consultants, business coaches, certified feng shui consultants, intuitive counselors, dreamwork consultants, spiritual mediums and more. Okay, so you’ve found the right consultant. What now? Even a lifestyle consultant will advise you on how maximize and prepare in advance of your first session. Because it’s all about making productive use of your time and money. Lifestyle consultants almost always charge by the hour or monthly retainer, so you should always go into your meetings with a clear direction in mind. Here are a few tips to help get the most out of each coaching or consultancy session. Identify your main goal. Ask yourself what you hope to achieve from your session(s). A lifestyle coach may help you in many areas of life, but there should be one main focus of your conversations (especially at the initial session). Remember that you will likely have multiple sessions where you can delve into various topics. And you’ll be most efficient when you target one main topic for each meeting. Depending on your needs and life coaching agreement, there may be extended time between meetings. Maybe you meet with your consultant biweekly or monthly. Between sessions, keep track of your progress in a journal. Review that journal before each meeting, so you can come up with talking points for the session. You may talk through challenges, triumphs or sources of confusion. Your life coach doesn’t need to know your life story, but be sure to share any and all relevant information. In order for this person to help you, they need to know all the pieces of the puzzle. Your coach or lifestyle consultant is a professional and will not judge you. So feel free to express your thoughts and concerns. Your life coach or counselor isn’t there to stroke your ego. You aren’t hiring a yes person. If that’s what you’re looking for, look elsewhere. Your coach is there to challenge you to become a better version of yourself. They want to help you. As such, they may deliver hard truths and harsh realities. Your coach will undoubtedly push you out of your comfort zone. That’s where success lies. If you’re facing any important decisions or want to refocus your efforts towards a new goal, it’s a great time to hire a lifestyle consultant. The only way to ensure you’ll get all these benefits is to work with a vetted lifestyle coach. You can’t expect miraculous results from someone you pulled off the street (or a quick Google search). It’s simply not realistic. If you’re ready to start your journey and find the best life coach or lifestyle consultant, check out some of our featured consultants. The AYRIAL vetting process validates that the professional lifestyle consultants uphold moral and ethical standards, including keeping their client sessions private and confidential. But if you’re not quite ready to connect with a consultant yet, don’t worry. Sign up for our newsletter or listen to our podcast for the latest in spiritual, insightful and professional guidance.